In this pattern the double left knot is introduced. The dotted part shows the complete pattern again, that can be repeated several times until the desired length of the bracelet is reached. Again, pay attention to the pattern on the left while following the description, to give you the feeling how to read and interpret the pattern, so that later on you only have to see the pattern to understand what to do. 7 Repeats of the pattern is about 9 cm (3.5 inch) long. For each repeat about 5 cm (2 inch) of thread is needed. 1. Start with placing the threads in the order as shown in the upper part of the picture. So, from left to right: green, pink, blue, purple, purple, blue, pink and green. 2. Start on the right side with making three double left knots with the green thread, first around the pink thread, then around the blue thread and finally around the purple thread. The green thread is now in the middle. Next make four double right knots with the green thread on the left, in succession around the left pink thread, the blue thread, the purple thread and at last around the green thread. With this last knot you close the V-shape. 3. Do the same with the pink thread that’s on the right: three double left knots in succession around the blue thread, the purple thread and the right green thread. The pink thread is now in the middle. Next make four double right knots with the pink thread on the left in succession around the left blue thread, the purple thread, the green thread and at last around the pink thread to close the V-shape. 4. Repeat this with the blue threads on the right and left and then with the purple threads on the right and left. 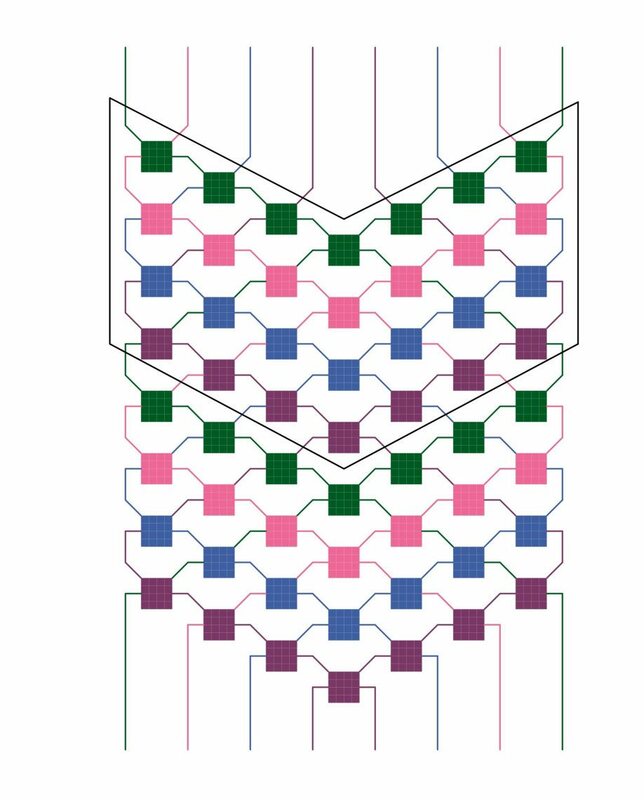 The pattern is now worked through completely one time, and the threads are in the same order again as how you started.